When talking about ethical and sustainable fashion, it’s never long before the subject of cost comes up. It’s understandable, as ethical fashion costs significantly more; posing a serious financial barrier to a huge amount of people. I’ll discuss the social implications and the strand of privilege that is woven through the issue later in the month but today I’m sticking to the ins and outs of cost. In terms of affordability, there’s no question that ethical fashion often falls far behind the high street. A quick browse on the Primark website dug up a white stretch cami top that costs £1.80. Ethical brands simply can’t compete with those margins. But why not? Just why is ethical fashion so much more? Why can you buy a dress from Topshop for £40 but would have to shell out over £100 if you went to the likes of Reformation? There’s no single answer, so I’m going to break it down. When you’re selling a camisole for £1.80, you’re working with minuscule margins. Into their unit price, a brand needs to factor fabric, manufacturing, shipping, taxes and their own profit margin (not to mention all the other costs which aren’t directly related to a garment such as marketing, rent and enormous yachts for CEOs to sun themselves on). These costs are all bundled in together; there’s no separate budget for wages. So, when there’s no more wiggle room left in the cost of cotton, for example, wages are squeezed even further. 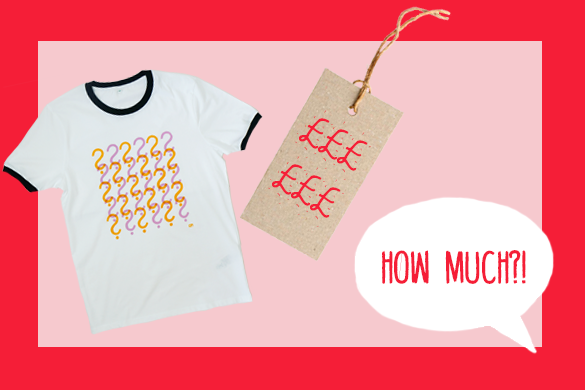 Simply put, you cannot sell a top for £1.80 and pay your factory workers a fair wage. The two notions are mutually exclusive. Their sister company, Visible Clothing, provides a completely transparent breakdown of the cost of their shirts. Rather than squeezing wages to up their own margins, they feed a further 5% of the price back into the tailoring team’s benefits on top of the £6 that goes directly towards their wages. Jo Salter, founder of Where Does It Come From? tells a similar story. Her brand works closely with social enterprises to create high quality ‘handwoven goods that can be traced right back to the cotton farm’. In order to make a difference to the workers’ lives, they pay significantly more than they would if they were working with a mass production factory. Jennifer Broom of ethical and carbon neutral-certified womenswear label brm also cited fair wages as a major factor in higher costs but for a somewhat different reason. Every piece the brand produces is handmade in the North East of England; a process that not only cuts down on fabric waste but is considerably time intensive. With no warp speed production line in place, prices must inevitably rise to offer the people spending hours making each piece a fair, living wage. While the likes of Primark can put in enormous bulk orders for thousands and thousands of metres of fabric, pushing the unit price or price per metre down, smaller brands or brands who are unwilling to create waste must order smaller batches at a higher price. In addition, the integrity of the fabric comes into play. Organic cotton, quality natural fibres and other ethical alternatives are much more costly than cheap fabrics which have a backstory riddled with exploitation of both people and the planet. Anna Brindle runs Lost Shapes, a handcrafted, sustainable and fair trade clothing brand. She buys t-shirts, sweatshirts and vests from garment distributors and hand prints each one using safe, water based inks. In order to maintain her sustainable ethos, she can’t simply buy from the lowest bidder. As she told me, “I only buy ethical garments – and by that I mean certified organic cotton or Tencel lyocell, which has been made in factories assessed and approved by the Fair Wear Foundation.” Other considerations include sourcing from carbon neutral factories, using recycled fibres and paying a further premium into the Fair Share Scheme (the latter is another nod to fair wages). Ethical, environmentally-friendly fabrics cost more to produce, more to buy wholesale and, inevitably, will cost a customer more when they purchase the end product. Shipping is another factor that comes down to dealing in smaller quantities. While a high street store orders in bulk, dealing with thousands or millions of units, an ethical brand that is committed to both quality over quantity and reducing waste is dealing with much smaller numbers. Tied in with shipping is import duty. As Jo Salter told me, it’s calculated upon the price you pay for your goods so, as carefully crafted items or organic fabrics cost more to buy, they also cost more to import. Bulk orders drive the cost per unit down and cheaper to buy means cheaper to import, once again putting fast fashion at a financial advantage. Plenty, sadly. While the three issues above were the most prominent among the brands I interviewed, a plethora of other extra costs popped up. From exchange rates and chemical free ink to recycled paper for swing tags. An ethical business is a multi-faceted thing. It’s not about just using organic fabric or only using recycled packaging, it takes a holistic approach to be truly ethical and it comes at a price. This idea was echoed by the other brands, too. They set out to educate and to communicate a value beyond price. This approach, coupled with a dedication to total transparency, encourages loyalty and garners repeat sales, which are key to ethical sellers. T-shirts featured in the post and on the cover image are from the Lost Shapes x Tolly Dolly Posh collection. Keep up with all the money month posts here. The eco fashion industry does talk a lot about still producing “new”…new fabrics, new clothing, new inking….but what about using what is already there? Dead stock? Maybe it wasn’t produced in an eco friendly manner, but where is it bound to end up? Landfill? I don’t know, but an curious. Why is fast fashion so cheap? That is a good question and maybe you should address it. These are certainly things I’ll look into in future! I’ve written previously about labels who use deadstock etc and it’s something that really interests me. Cool. I did forget to state “why” I mentioned dead stock. It was about the “money”. Maybe dead stock costs less and therefore, can be passed on to the consumer through lower priced garments. Anyhow, I’ll have to go back and read your dead stock posts. Cheers.